He's ready to get out there. Bet he is thinking to himself, let's get this show on the road. I may put it in the b/w challenge. Great shot Carol good luck in the challenge. 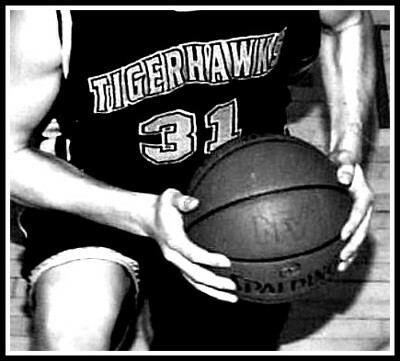 Good luck to the Tigerhawks! Great looking black and white shot, Carol. I like how it looks like an old photo, Carol. It is basketball season here as well. Wonderful sporting close up Carol - would work great in Lyn's B&W. This would make a very good entity for the B&W contest and I love how it las a look like it was taken many years back,Stunning detail and it dies have a look like he is compleat is next move in the game too.